Airhop is one of the first trampoline parks in the UK with 2 massive venues in Guildford & Bristol and more venues set to open in the UK & Europe in the future. 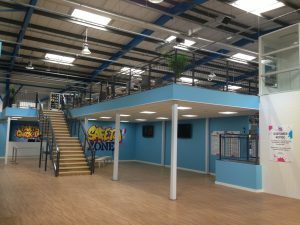 Airhop needed new mezzanine floors and walkways for their new trampoline park in Bristol and having used HMF at their Guildford site they were keen to use HMF again on this prestigious project. 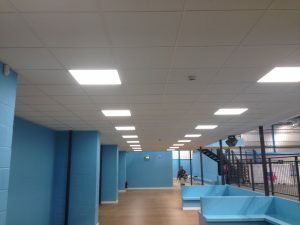 The solution to the project was a new mezzanine floor to form a public seating area and for new walkways and platforms around the trampoline and ball pit areas. 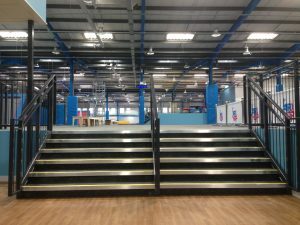 The mezzanine floors were enclosed with public access hand railing to comply with the latest health and safety legislation. The mezzanine floors were designed with reduced deflection (unlike the trampolines!) to provide rigid walkway areas. The floors were braced for stability and were left ready for final rubber flooring finishes for the client to fit. HMF also worked in conjunction with the client’s trampoline installers to ensure that the project integrated with their sub-contractors.